A couple weeks ago I ventured into the barbarous climes of Mordor to deliver the workbench to the Library of Congress Book Conservation group. If the traffic and multitude of high-dollar construction projects are any indication, the travails of the provinces are not being felt in the capital city. In fact it looks like a boom town that has four trillion of our dollars at its disposal every year. And since we apparently are not motivated enough to demand that they stop spending those four trillion dollars every year on us, that trend line will remain unchanged. The logistics of getting into a secured facility (and in Mordor virtually every facility is secured) is a challenge. It turned out that the most efficient way to get the workbench into LC was for me to drop it off at the curb in front, with LC staff taking delivery of it there. 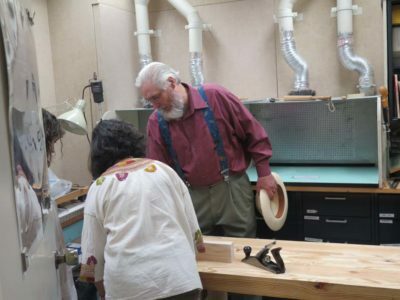 Once I parked and rejoined them we were able to get through the security checkpoint and proceed to the conservation lab. Admittedly, I felt under dressed with my Victorinox Spirit muti-tool sitting in the van outside. 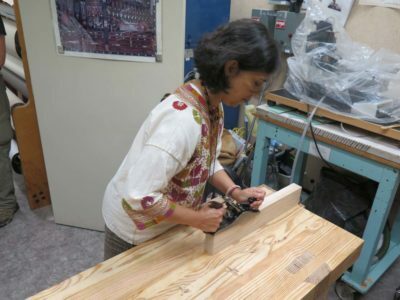 The path to the final home for the workbench was uneventful, and the crew there was delighted to get their new tool. 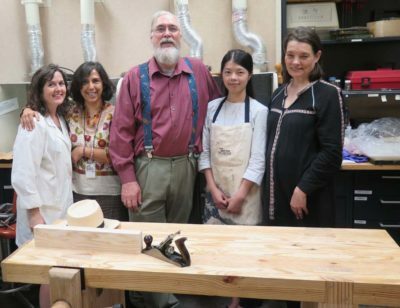 Particularly pleased were the petite members of the staff, many of whom wrote me a “Thank You” note for taking their physiques into consideration when fabricating the variable height configuration of the bench. 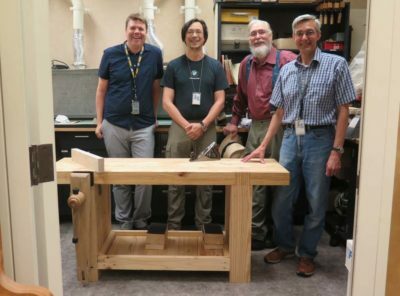 The bench fit perfectly into the tiny Tool Room space they have, and after I spent a little time explaining its features it was given some tryouts almost immediately. And then I escaped before the Dark Eye poisoned my heart any more. 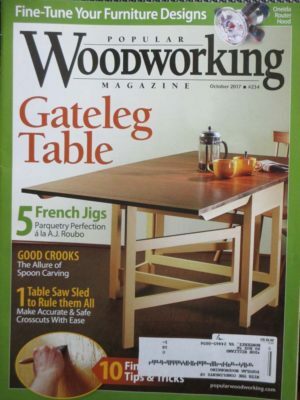 The newest PopWood arrived int he mail recently and it contains my latest article for them. 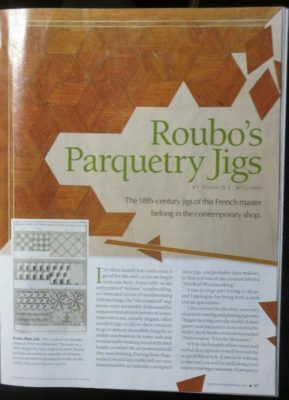 If the topic interests you, I hope you will join me at the Marc Adams School of Woodworking where my workshop on parquetry will revolve around making and using these jigs. As we run-up this week to nuptials for Younger Daughter we were blessed with a visit from her last weekend. 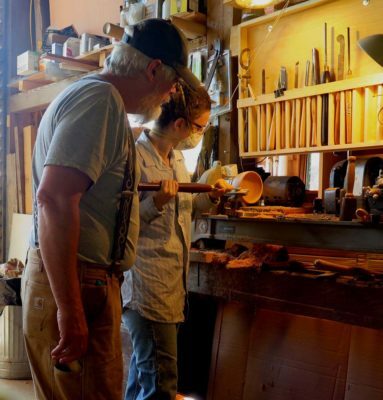 Much of the time she spent with Mrs. Barn doing wedding-y stuff, but she spent a few hours in the shop with me turning a bowl. 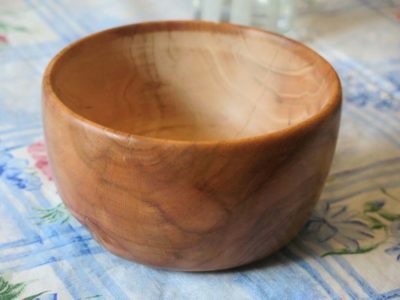 The wood for this bowl came from a plum tree in the Maryland house yard that died of natural causes some years ago (she remembers climbing the tree as a tyke), and I harvested the wood and set it aside for something special. This definitely fits the description. 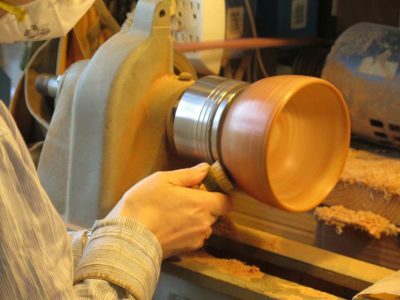 I had in recent months found the faceplate for the lathe and ordered a threaded insert from Woodcraft so it could be put to work. 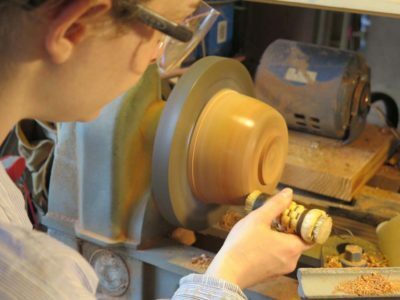 Before she arrived I mounted the piece on the faceplate and roughed it round (she is not yet experienced enough to bring a really rough piece to round comfortably). 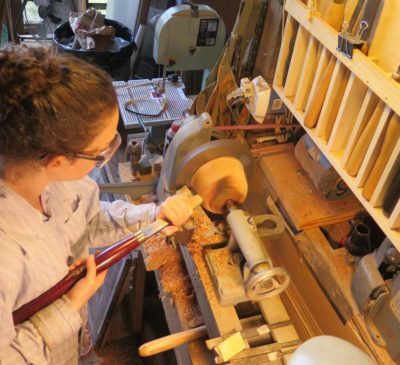 The lathe is a bit high for her, so in the early stages she was most comfortable with the scraper tucked in the armpit. 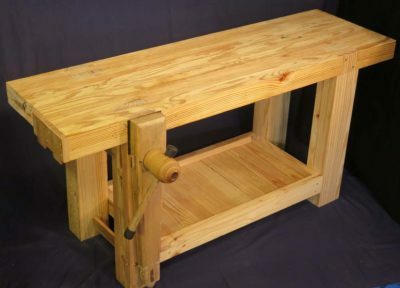 I will be building a lower base in the coming weeks. I gave her only a few pointers as she developed the outer shape she wanted. 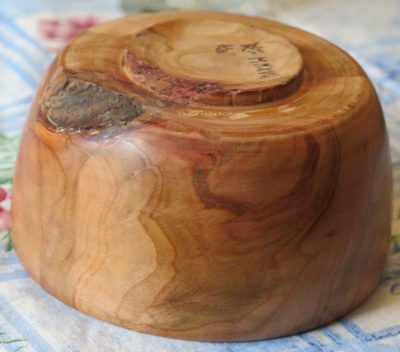 Before long she had the outer surface defined and embarked on an initial sanding and polishing. 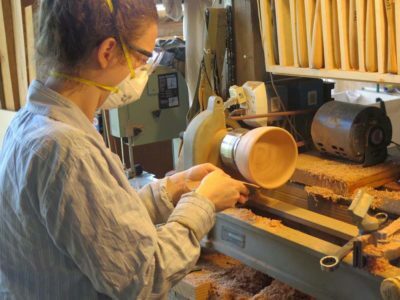 With the base established and the shape determined it was time to remove the faceplate in favor of the small bowl chuck and get started excavating the interior. Soon she was in pretty deep. 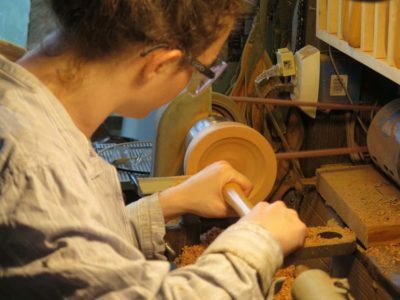 We stopped for the night, but on returning the next day she refined the shape and surface. To be sure the watchful papa bear was never far from the action. The working height was just plain awkward for her but she hung in there without complaint. 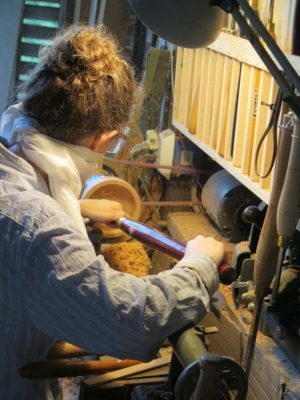 After the final shaping she moved to sanding and then polishing with beeswax melted into the surface, buffed with a linen rag while turning. She particularly liked my method of placing a dry sponge between the hand and the sandpaper, it allows greater vigor with less heat. And here it is, an heirloom with a priceless memory attached. In all likelihood it was our final private time together with her as Miss Barndaughter until those moments just before I walk her down the aisle, and it was a precious treasure. 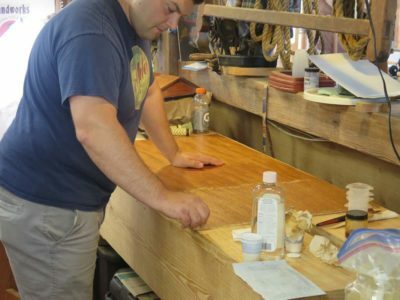 With the foundation laid for good finishing it was time to move on to undulating surfaces, the kind of finishing that gives many woodworkers fits and nightmares. 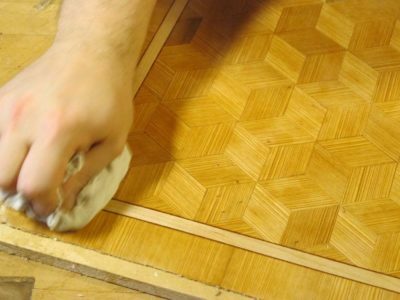 Fortunately it is no more complicated or straightforward than finishing plain flat surfaces. 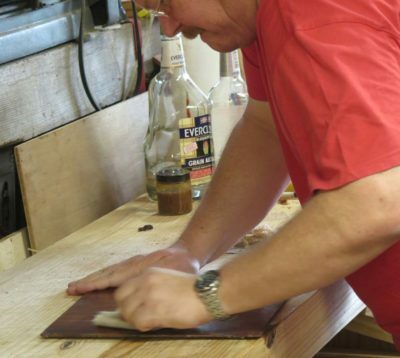 It’s all about surface prep, varnish prep, and tool selection. 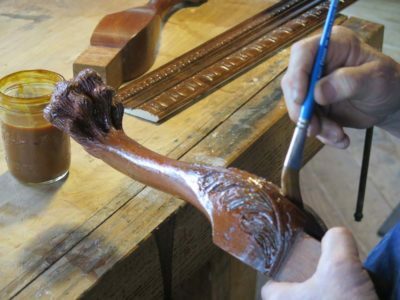 Switching to the “carver’s model” polissoir the surfaces were burnished in preparation for varnishing. 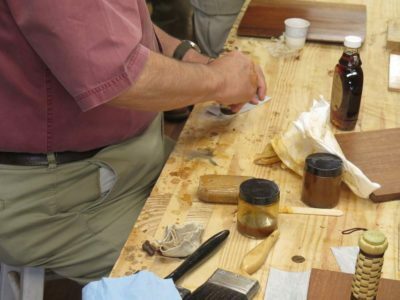 Then, on to applying the varnish. The true key to success is the right brush, a fine bristle watercolor “Filbert” with a rounded tip. 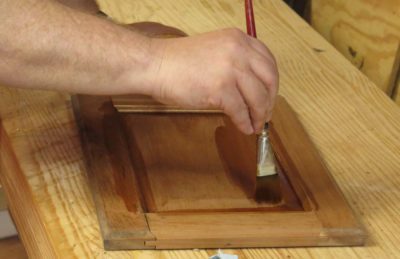 The Filbert allows for tremendously good “drape” of the bristles around the surface, not sqeegeing off varnish with the resulting runs like you might get with a square tip brush. 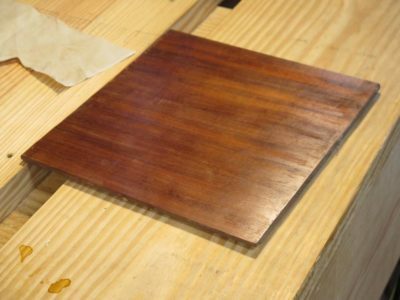 A few applications of the shellac varnish to these surfaces and they were ready to set aside, to be burnished with steel wool and waxed later on. 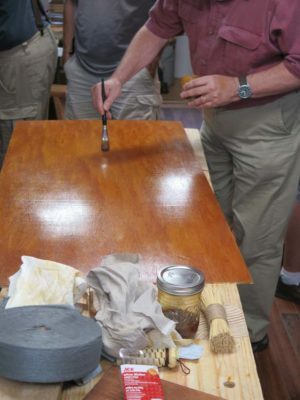 Next we revisited the luan panels we had started the day before, undertaking a light scraping with disposable razor blades followed by a brief but vigorous rubbing with 0000 steel wool. 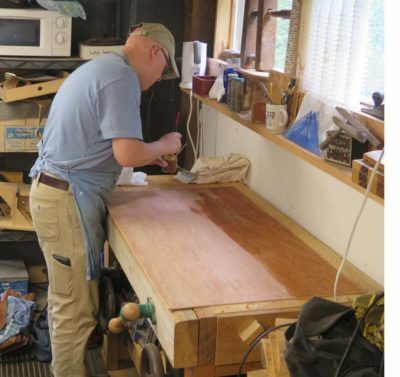 I have found scraping to be not only historically accurate (obviously not with modern disposable razor blades, but the concept and practice are still the same) but now to be an integral component in my finishing process. 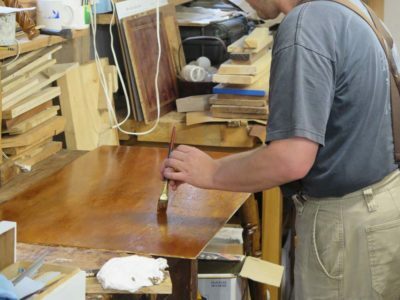 Then another inning of shellac application, followed at the end of the day by the third and final inning. By then the surface was beginning to get some sparkle. One last exercise was to finish a raised panel door. I do not recall where these came from but they have served me well in this regard for many moons. 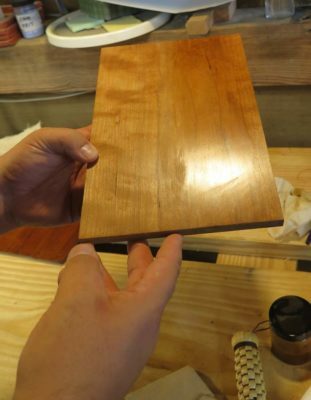 Again, a few applications of shellac followed by rubbing out with steel wool and paste wax yielded a luxuriant surface. By mid-day on Sunday the party started breaking up, but the students left with a new confidence and a sharpened set of skills. 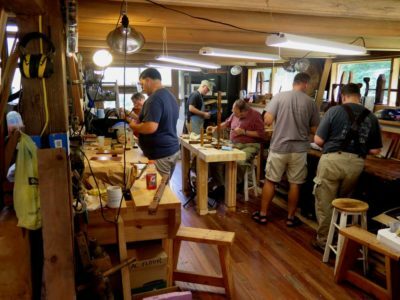 Folks may be reluctant to come to The Barn on White Run because of its remote location, but once here they always love it and go home with more knowledge and skill than they arrived with. That’s not a bad outcome. 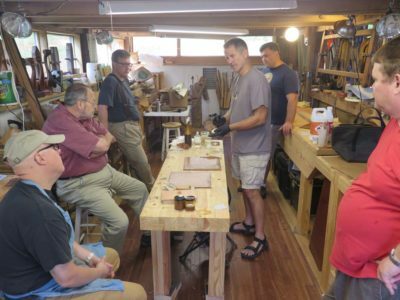 I recently hosted and taught a “Historic Finishes” workshop at the barn, with five attendees from around the country and my long-time friend DaveR as a teaching collaborator. The objectives were to help the students overcome any hesitancy about finishing by learning new habits and techniques, and the results of the exercises indicate success. Our first exercise was the one that was most time sensitive in that it required three inning of finishing over two days, which was pushing the technology a tad. Fortunately the weather was cooperative. 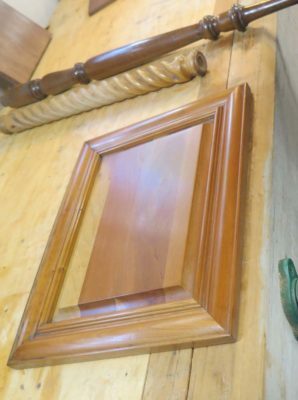 The task at hand was to take an essentially unprepared 24″ x 48″ panel of luan from Lowes to see what could be done with it, some well-prepared shellac varnish, and good brush. 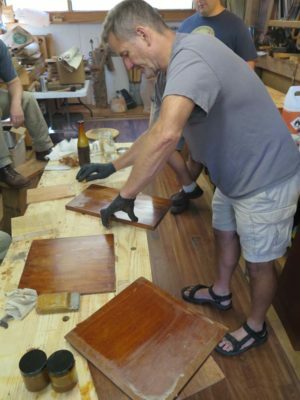 After a brief scuff sanding with 220 they began to lay down the 1-1/2 pound shellac as I have taught multitudes before them. 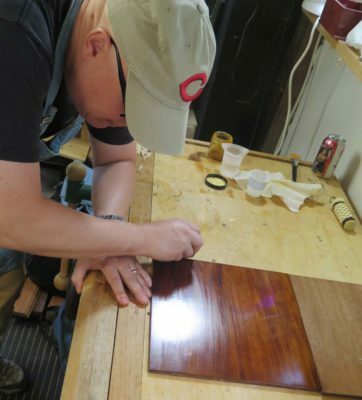 The purpose is of exercise to overcome the trepidation in applying shellac spirit varnish. 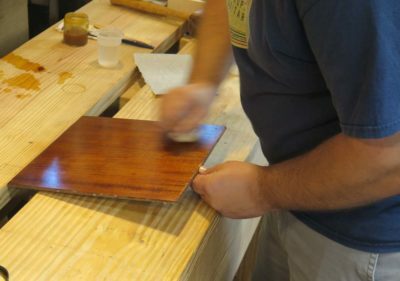 Next came the grain-filling of some solid mahogany panels with molten beeswax as the foundation for pad polishing. 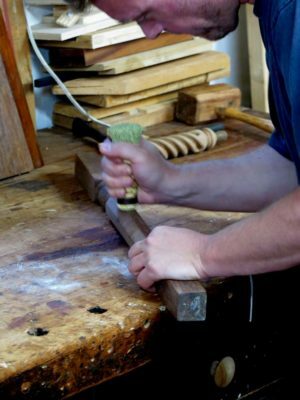 This was how they did it in the old days, and it is still my preferred technique. 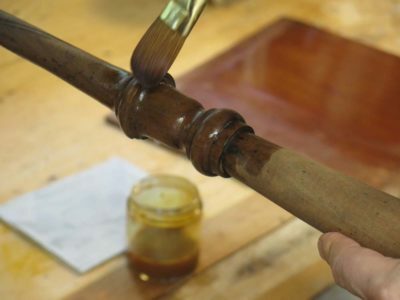 The wax was melted in using a tacking iron (I cannot believe I did not get any more of this on camera), then scraping off the excess and buffing it out with linen. Even at this point the results are impressive and in some circumstances the finishing would be called complete. 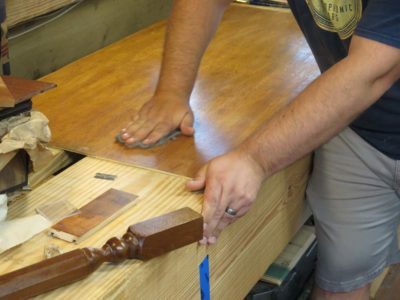 All eyes were glued to Dave as he walked through the process of this technique which has garnered much (undeserved?) mystical reverence. 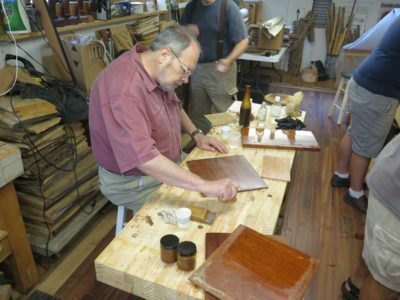 He demonstrated the process of making a good pad, or “rubber,” which can last a finisher for decades, and before long they all set to making their own. Before long we were seeing some mighty fine sheen. It was time to introduce the newest tool in the contemporary finisher’s kit, the polissoir. 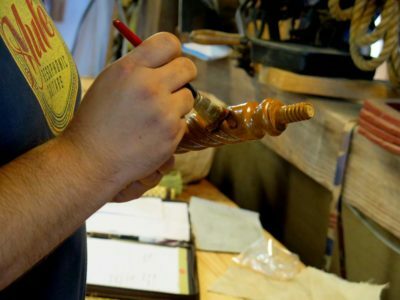 Everyone got their own brand new one that needed to be tuned up on a piece of fine sandpaper . 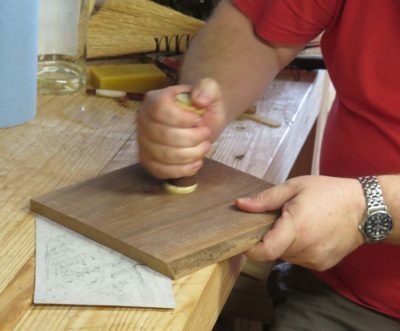 And out to work, first over bare scraped wood, then in concert with beeswax that had been scrubbed on to the surface. Again, the final results were immediate and gratifying. 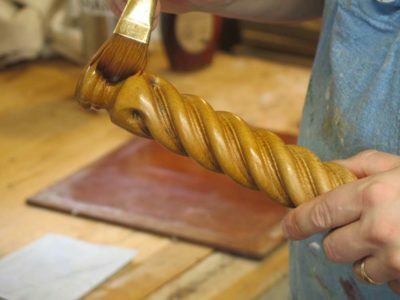 Up next, brushing carvings and other undulating surfaces. After an astonishing amount of work from people on two continents – not to mention hundreds of thousands of dollars of investment – a surprise showed up at the front door today. It was a FedEx driver in a big truck. Sign this, he said. And then five boxes were sitting on the front step. Inside were the first copies of the deluxe version of “With All the Precision Possible: Roubo on Furniture.” It’s the biggest (physical and mental) thing we’ve ever published at Lost Art Press. It’s also the most expensive book we’ve ever made (and probably ever will make). The book is now sitting in front of me, and I’m still a bit bewildered. 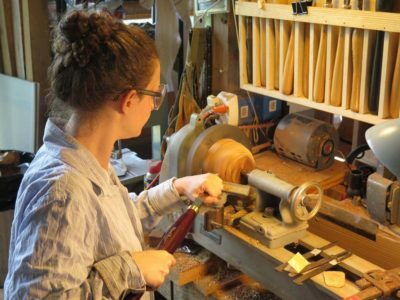 It’s like our deluxe edition of “Roubo on Marquetry” (now sold out) but more than twice as thick. I’ll have more to report on the book as we get it into the mail to all the customers who ordered pre-publication copies. And we’ll definitely have copies to show off at the next open day on Saturday, Sept. 9. P.S. FYI, this book is available for worldwide delivery. Choose “Outside USA” when checking out and we’ll contact you about the actual delivery charges to your address. Jameel and Fr. 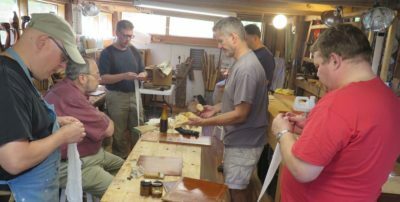 John and crew posted a superb video summarizing 2017 Handworks, where I gathered with several thousand of my closest friends to celebrate hand tool woodworking. If you were there, this is a sweet taste of remembrance. If you were not there, it is a bitter taste of regret. 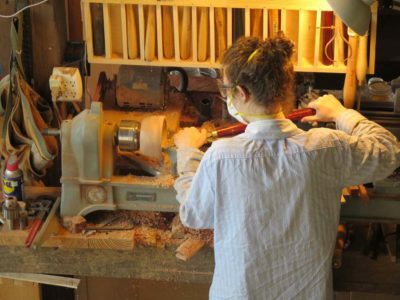 Offspring nuptials often cause woodworkers to deviate from their normal regimen of projects. I am no different. 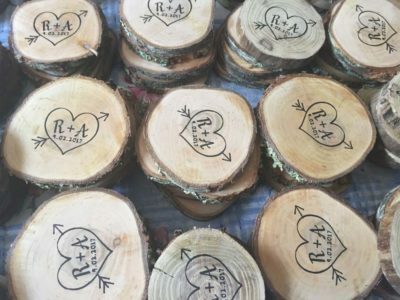 Over the past fortnight I’ve been making hundreds of wood wafers as coasters for wedding mementos. Of course I outsmarted myself by carefully sealing both sides of the coasters to reduce splitting, but then found out the ink would not stick to the varnished surface. So I had to sand one face of each of the ~250 chotchkis on my disc sander to prep them for stamping. 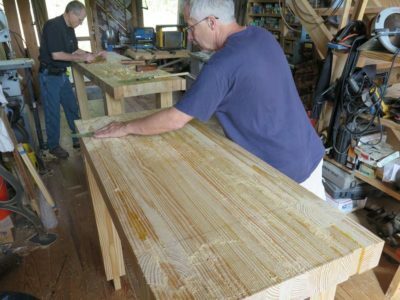 I’ll be ordering the lumber this week for the Sept. 4-8 “Build A Traditional Workbench” workshop at The Barn, so this is the last chance to register if you want to participate. I will close the books on this at 5PM Wednesday. 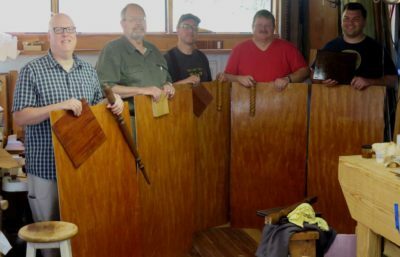 If you would like to join us and go home on Friday with a finished bench, contact me here. 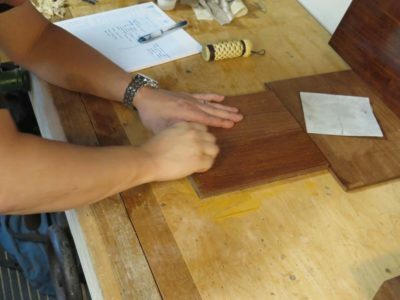 In October I will be teaching a pair of three-day workshops at the Marc Adams School of Woodworking, a Monday-Tuesday-Wednesday session introducing 18th Century Parquetry, followed by the Thursday-Friday-Saturday workshop on Traditional Finishing. This is something of an experiment for Marc schedule-wise, and I very much appreciate his accommodating me in this.